I so wish these Lindam clarity digital video monitors had been around when my children were babies. I think it would have made a huge difference to their sleep and mine! 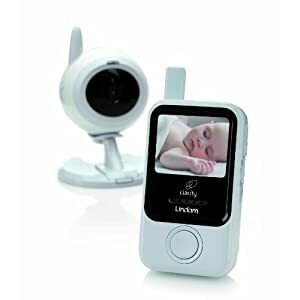 It has a microphone and camera for audio and visual monitoring which stops you having to peak in the room to have a look at your baby if you can’t hear them or ‘just to check.’ This means you can relax and that you aren’t disturbing your baby. The clarity of colour picture and of the sound you get is excellent. me and my kids played with this around the house before passing to our tester and we had lots of fun. I could see them really well and hear and understand their whispers. My tester said the same and that it really reassured her that her 7 month old baby was okay without her needing to pop upstairs all evening. She even found the night vision to give a good picture. You can turn on lullabies to play to your baby remotely through the unit without the need for you to to go in again and again and this way they will learn to settle themselves. A lovely baby night light of stars can also be activated from the parent unit to reassure baby. The video unit can be wall mounted or portable so you can take it with you to a friends or easily move it to other rooms where you baby is napping or playing and you want to keep an eye on them. The audio unit is also portable so you can get on in the garden or the kitchen wherever you want knowing you can still see and hear your little one. These little extra features make this very useful. The VOX feature is the same as the “Automute” however it also turns the screen off as well as the speaker, so when the baby makes a noise it turns the screen on too. This stops you staring at the screen all night. I think any product that reassures you about your child is fab and one that also gives you a bit of a break form constantly physcially running round after your kids ispretty fantastic too. Maybe you will sleep more easily. My tester and I give this a big thumbs up. These currently retails at £129.99 at Amazon but mine was sent for review from Little Pumpkin an online baby boutique, who sell ‘baby products & baby accessories that make a difference’ Little Pumpkin offer a range of carefully handpicked mid to high end baby accessories, baby products and other stylish baby stuff.They sell this monitor for just £99.99 which is a £30 saving over Amazon.